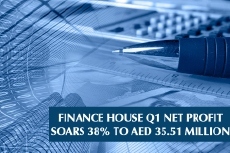 Abu Dhabi, 23 April, 2014 - Finance House PJSC (FH), has kicked-off 2014 on an upbeat note by registering a consolidated net profit of AED 35.51 million for the first quarter of 2014, which is nearly 38% higher than the net profit of AED 25.81 million earned during the first quarter of the previous year. Total Operating Income jumped nearly 52% to reach AED 91.20 million in Q1 2014, compared to AED 60.14 million in Q1 2013. Net Fee and Commission Income grew by a whopping 72% to reach AED 15.53 million in Q1 2014 compared to AED 9.04 million in Q1 2013. Net Investment Income from a diversified investment portfolio rocketed to AED 48.65 million in Q1 2014, compared to AED 11.69 million in Q1 2013. Net Interest Income earned during Q1 2014 was lower than Q1 2013 due to one-off adjustments in the previous year, primarily on account of recoveries made under rescheduled commercial loans. Net Loans & Advances including Islamic financing & investing assets grew by a steady 8.6% YOY to reach AED 1.65 billion as of 31 March 2014, compared to AED 1.52 billion at the same time last year. Customers’ Deposits grew by an impressive 20.6% to reach AED 2.05 billion as of 31 March 2014 compared to AED 1.70 billion as of 31 March 2013. The resultant Loans to Deposits ratio as of 31 March 2014 stood at a healthy 80.5% compared to 89.4% as of 31 March 2013. Shareholders’ Equity as at 31 March 2014 stood at a robust AED 690.3 million compared to AED 641.5 million as of 31 March 2013. This is after setting aside for distribution, a cash dividend of 25% in March 2014, amounting to AED 75.63 million for the year ended 31 December 2013. Liquid Assets to Total Assets as of 31 March 2014 was circa 36%, reflecting the Company’s conscious approach to maintain abundant liquidity at all times. Capital Adequacy as of 31 March 2014 was a robust 24.8%, with ample room for accelerated loan/ asset growth in the foreseeable future. Earlier this year, FH secured investment grade corporate credit rating of “BBB-“(Long Term) and “A3” (Short Term), both with a “Stable” outlook from Capital Intelligence (CI), an internationally reputed credit rating agency. “We remain confident that our strategy of continuously seeking and addressing profitable niche segments will enable us to continue generating healthy returns to our shareholders on a sustained basis”, concluded Alqubaisi.